The numbers of excellent hyperlocal websites in the UK and the US bloomed in 2009, from The Lichfield Blog, Bournville Village, Kings Cross Environment and Pits n Pots in the UK; to CrossCut, Red Bank Green and the Ann Arbor Chronicle in the US. But will they fill the void left by shrinking, or dying, local newspapers? That is the challenge laid down to them; and if hyperlocal blogs and websites are to have any lasting resonance as a new way of doing news, they will have to live up that, and move beyond simply aggregating other content and hosting a listings site. In other words, they must become newsgathering operations in themselves: finding stories, checking facts, holding powers to account and sharing the results with their community of readers. In 40 pages it covers everything from getting news from council agendas and press releases, finding out about crime, keeping on top of your local sport team and submitting Freedom of Information requests. In it are the tools you’ll need to create a one-person newsroom, which gets all the important press releases and has all the important contacts. You’ll find out how to create and manage an effective news diary which means you rarely miss a big story. I explain why you don’t need to pay for expensive news wires to get confirmation of big national news stories on your patch, and show you step-by-step how to submit an effective Freedom of Information request. The end of the book contains an appendix of templates you can print off and use to get started. It’s based on my years as a local reporter, at times single-handedly managing a news desk which covered no fewer than three counties at once. I learned the hard way how to report on local news, and it’s all in Newsgathering For Hyperlocal Websites. This book is ideal for anyone who is setting up a hyperlocal website, or is thinking about it. All the information I have shared I have done so with a small hyperlocal outfit in mind: there is no other journalism guide book like it. Journalism students will find it a great simple breakdown of the newsgathering operation. It is written chiefly for the British hyperlocal blogger, and although the terms will differ in other countries, the techniques are applicable in the US, Europe and beyond. If you’re a journalist with years of local newsgathering under your belt, you will probably know most of it already. However, if you are not used to covering a patch/beat single-handedly you will find the contents useful, no matter how long you’ve been in the trade. I’m publishing it with an awesome discounted price of £4.99 (~$8.00/EUR5.50). This will last for 7 days at which point it’ll go up to its normal price, so buy quick to get the good deal! Click here to get your mitts on one! Any feedback on the first edition will be much appreciated: I’ll bear everything in mind for future editions! Update: hyperlocal blogger Philip John over at JournalLocal has reviewed the book. « Now it’s easier to get professional shots with a Minicam! You offering it as an affiliate incentive? What do you mean by the term hyper local? I am sorry, but I am new to this word. 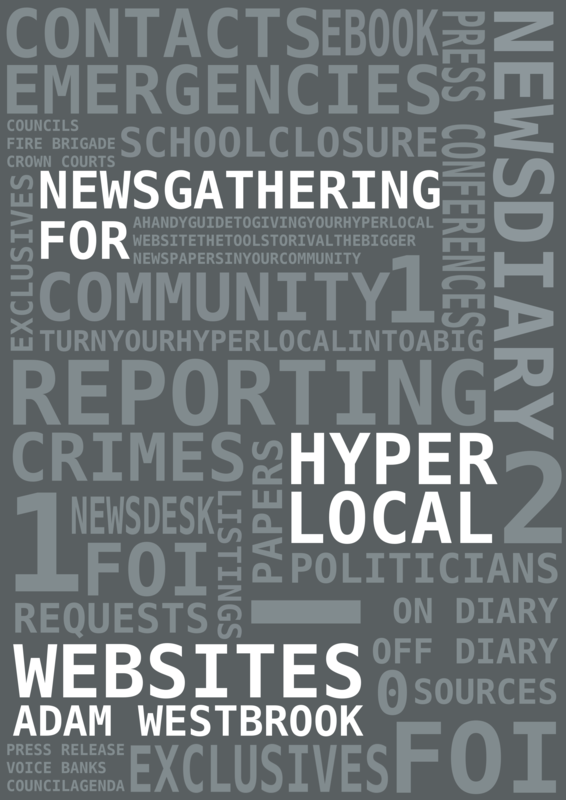 Hyperlocal refers to news websites or blogs which cover a very small area, just one town or even one village. Hi – just a quick note to say thanks for this entry. Very interesting. I have been using it for more than six months and it is amazing!!! Thanks,it’s really an interesting article. superb… for reading it, Nice article. Excellent blog post, I have marked this site so ideally I?ll see much more on this subject in the foreseeable future! Howdy, I do think your web site could possibly be having web browser compatibility problems. Whenever I look at your site in Safari, it looks fine however, if opening in I.E., it has some overlapping issues. I simply wanted to provide you with a quick heads up! Aside from that, excellent blog!